A labyrinth is a meandering path, often unicursal, with a singular path leading to a center. Labyrinths are an ancient archetype dating back 4,000 years or more, used symbolically, as a walking meditation, choreographed dance, or site of rituals and ceremony, among other things. Labyrinths are tools for personal, psychological and spiritual transformation, also thought to enhance right-brain activity. Labyrinths evoke metaphor, sacred geometry, spiritual pilgrimage, religious practice, mindfulness, environmental art, and community building. Labyrinths are named by type and can be further identified by their number of circuits. Counting from the center, the drawing at right illustrates a seven circuit design. You begin a labyrinth walk at the entrance and proceed along the path. Lines define the path and often maintain a consistant width, even around the turns. Generally at the center you have travelled half the distance, where it is common to pause, turn around, and walk back out again. A left- or right-handed labyrinth is determined by the direction of the first turn after entering the labyrinth. 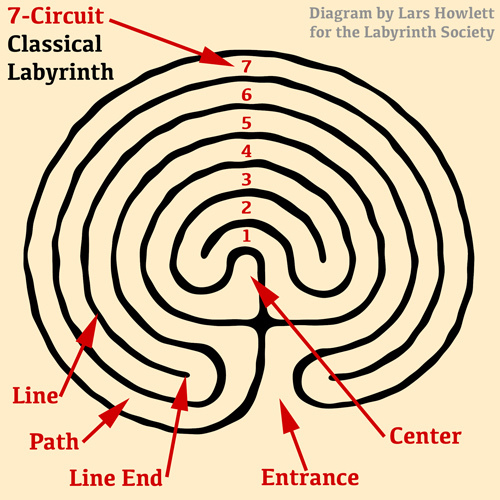 Jeff Saward estimates that approximately two-thirds of the ancient Classical labyrinths were right-handed (as depicted above) and two-thirds of the modern Classicals are left-handed. Neither is better than the other—it is totally up to personal preference. As our awareness of labyrinths expands, it is important to keep our terminology consistent. One example of a now outdated name is calling the Classical Labyrinth the Cretan labyrinth. Some people call the lines 'walls,' but as most labyrinths are two dimensional this can lead to confusion. With this in mind, Jeff Saward and Sig Lonegren—with the help of Marty Cain, David Tolzman, Lea Goode-Harris, Alex Champion and Robert Ferré— began an ongoing dialog with the goal of providing clarity for a working labyrinth typology. Lars Howlett updated these resources also building off of the work of Erwin Reißmann and Andreas Frei.